Can I Run with a Partial Rupture of the Plantar Fascia? Can I run my race if I have a partial rupture of the plantar fascia? Well that’s a question I’ve got in a number of times from runners who’ve been to the doctor, they thought they have plantar fasciitis, they were told they had a partial rupture or a tear in the plantar fascia and then they want to know if they can do their race. So in this session we’re going to explain how you can decide whether or not you really can or should run when you have a partial rupture in the plantar fascia. Again the plantar fascia is just a huge sheet of collagen, it’s the largest ligament in your foot. 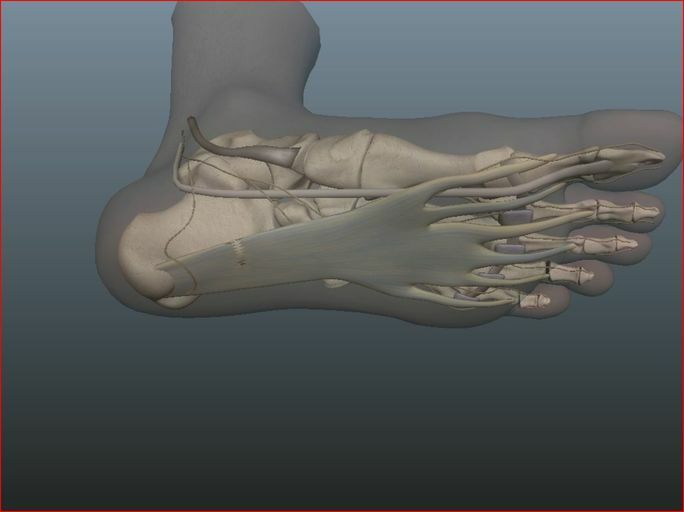 It’s a big sheet of collagen that starts at the heel goes all across the bottom of your foot and attaches to the toes. Now in the house of a fascia is just a covering along the roofline. But fascia is not just covering in the foot; it’s a structural element. So you have to realize that if you tore it, you stressed it enough to actually rip it. So something went wrong, you landed wrong, you stepped on something wrong, you severely pronated your foot while you’re running. Something applied enough force to that fascia to actually tear it. So that’s not really complicated. If you do the same thing that you did to injure it, it’s probably going to get worse. Now granted, most people don’t really get a tear in the plantar fascia from just a long run or one speed session. It usually they’re doing something suddenly change in direction where forcibly pronates the foot really applies a lot of stress to the fascia and it rips. If you’re suddenly running downhill and you land on a trail like at a really sharp angle that pronate your foot under a lot of force, and it’s already inflamed, it’s already a little bit damaged because you’re ignoring your plantar fasciitis, then maybe it could rip then. Obviously you don’t want to do that again. But that doesn’t mean you can’t run with it. Now, whether or not you should run plantar fasciitis, I really think about it two-ways. The short answer is “No, you shouldn’t run”, that’s what every doctor’s going to tell you. The reason they tell you that is they want you to heal. So if you tear the plantar fascia and you keep running on it, it’s not going to heal. But what I think about because I only work with runners, I think about okay what are the consequences of that because nothing is free in medicines. If you don’t run, you’re going to pay for something. You’re going to lose all your fitness, you’re going to get weaker, you’re going to get stiffer, you’re going to get totally bummed out because you’re not running. And your friends aren’t going to hang out with you because you’re going to be a miserable person. So you always have to give something up, whenever you do something that a doctor tells you to do. The way to think about it is like “Okay, how important is the race? And how important is it to get it to heal? And are you really at risk of doing something to really permanently damage it”. Like for example if you have a tear in your Achilles tendon, it’s a partial tear and you go do a 100 mile trail race, there’s a really good chance you’re going to rupture your Achilles tendon and you’re never going to be the same, or never going to be able to really fix it in a way that you’re going to be the same again. In that case, no way should you do that. A partial rupture of a plantar fascia is a little different. 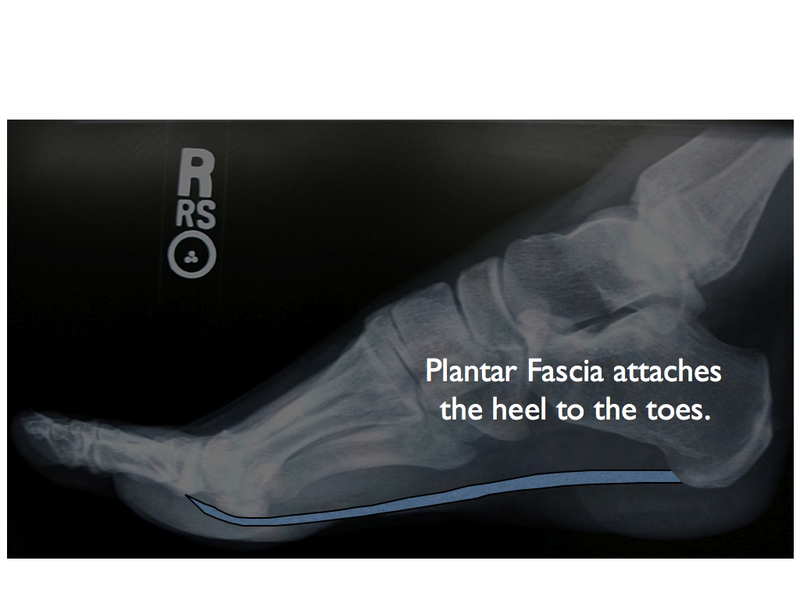 When we do surgery on the plantar fascia, we actually cut the plantar fascia. So if you tear the plantar fascia, well basically it’s like a surgery for free. Okay, just to be clear if I told you to do that, if your doctor told you do it, that would be malpractice, that’s crazy. It’s interesting that some trainer put up a video that said you should do that but that’s not, so you definitely shouldn’t do that. Indiscriminately ripping anything is not a good idea. You don’t want to do that. But the main point of this is that the end result is that when the fascia is completely torn or we cut it in surgery, we kind of do that as a normal treatment. If you’re fascia is partially torn, it’s not the end of the world. The way I think about it is, is it going to make you worst, like permanently worse? Is it really going to disrupt your running in the future, if you run on and make it a little bit worse? The truth is, not really. What I mean by that is that a hundred percent of the time, I’ve had one specific treatment that has worked to heal partial ruptures in the plantar fascia. It’s an inconvenient routine. I’m not going to go into it here, but it will work. You have to use some crutches for a little while, you have you to use a boot for a little while but it always works consistently and no you don’t have to do any fancy injections like PRP or any of that. Yes, you could do platelet rich plasma injections for a partial rupture of the plantar fascia. But I don’t normally do it because I can always get patients to heal with the standard routine that I always do. That’s what I teach to physicians when I go to medical conferences. Now the other important thing that I teach to doctors when I go to conferences is like look, you have to sit down with your patient. You have to say, “what is your goal? Do you really want to do this race? Like have you been training for a year for the western states 100?” Well if you’ve been training for the western states 100 and you have a partial rupture in your plantar fascia, do you want to try it again and again? I mean it’s difficult to get in into that race. If you finally got into Ironman Hawaii after 10 years of trying, do you want to skip Ironman Hawaii? I bet probably not. Then you have to decide “Okay, can you tune out the pain enough to make it through the race and can you do the race and not really make it worse?” The truth is that most of the time if you have a partial rupture in the plantar fascia and you run on it, yes it’s going to hurt, it’s not going to feel great but you’re already used to that. You have been running on it anyway. And if you can make it through your race, you can still heal it later. I actually had one runner and she was tough as nails but she ran for year-and-a-half on a partial rupture of the plantar fascia and then when she was finally done with this whole series a long trail races she was doing, she did the routine that I gave her and it actually healed her plantar fascia. So in that respect, you could say yes you could run on a partial rupture of the plantar fascia. You just have to realize it’s not going to go away. It’s very difficult to get the plantar fascia if it’s a really a bad partial rupture to really and truly heal. Now the other thing to talk about, there’s a range of trouble, it’s not just like a huge rip of the thing it’s completely separated. It’s almost never completely separated; it’s a partial rupture. If it’s a big partial rupture, it’s very difficult to get that to heal while you’re still running on it. But sometimes when you have a small like partial rupture, which of course the radiologist just reads it as a partial rupture. There’s no difference in what the radiologist says based on whether it’s a really really bad partial rupture or just a teeny tiny little partial rupture. If you have a tiny little partial rupture what I call it interstitial tear where if you think about a rubber band and there’s a tear in the inside of the rubber band, so you could like stretch the rubber band out, hold it up to the light and see the little tear if you hold up to the light. But when you’re just looking at the surface of the rubber band, you don’t see any tear. That’s an interstitial tear. You’ve got fascia on top and on bottom all stable supporting that little tear and so if you can do some stuff to decrease the stress on the fascia, if you can supinate your foot a little bit, run on the right side of the road, do something, stretch the Achilles tendon. Do some things to remove inflammation to get it to improve a lot then there’s a good chance you could actually still run and it could still heal. The key there is you have to decrease the stress on the plantar fascia enough so that that collagen can start to repair itself. Yes, it may help if you sleep more. It may help if you take collagen supplements. It may help if you have copper in your supplements. It may help if you have turmeric to remove inflammation. It may help if you have any of these other things that we know can promote healing, like a really healthy diet and again if you don’t start changing your diet or take a nutritional supplements or anything else without talking to your doctor, but if you do the right stuff, if you have all the ingredients in your body that will heal that collagen and help repair it, that moves you a little farther along that continuum of being able to run and still heal. You have to do more of the stuff that’s going to help it heal, like supporting the nutrition of the actual collagen in the plantar fascia, making sure you’re resting enough that your sleeping enough that you’re not too stressed out, that your hydrating, that your diet has antioxidants and protein so that you can actually heal. But then you have to do less of the stuff that’s messing up your healing. That’s not really complicated. If you supinate your foot, decrease some stress on the plantar fascia. If you hold your foot in a little bit of a corrected position when you run or use the running surface underneath you to put you in that corrected position and then you can track your progress using a Pain Journal, which you can get it on “How A Pain Journal Can Help You Get Back To Running Sooner“. Just go there, you can go to this episode you can download that Pain Journal for free. I’ve made it for runners so that you can basically print it out. It has everything you need to fill out in there to keep track and then watch. If you’re pain is going down and you continue to run, there’s a really good chance you’re going to heal. If your pain is getting worse, if it’s swelling more, if it’s bruising, well that’s a bad sign. So you’re not going to get better if it’s continuing to have all these signs of trouble like, more swelling, you have bruising, you have a lot more pain. Obviously that’s a bad sign and you have to decide then you if want to keep running and suffering or do you want to stop running and get it to heal? But running is not the only thing; it’s stress, its just stress. So when a doctor said stop running, they want to reduce the stress. They want to put you in a cast, they want to reduce the stress. There is some interim solution for most people, in my mind even when you need crutches, even when you need a fracture walking boot, there is no one thing that works. So even though what I call a standard routine that I teach to doctors, it isn’t standard, it’s checking you every single week to see “Can we stop the boot now? Can we stop the crutches now? Can we get you back to running now?” I don’t just say this many weeks in a boot and this many weeks on crutches. It’s individualized for every single person. It’s another way to figure that out on your own the same way that I tell doctors to figure it out, but it’s not complicated. You just have to figure out what’s right for you. You have to control all the variables you can control to reduce the stress and speed the healing and then get back to running as quickly as possible. That’s really the key when you have a partial rupture of the plantar fascia. Realize, you’re not the same as everybody else. 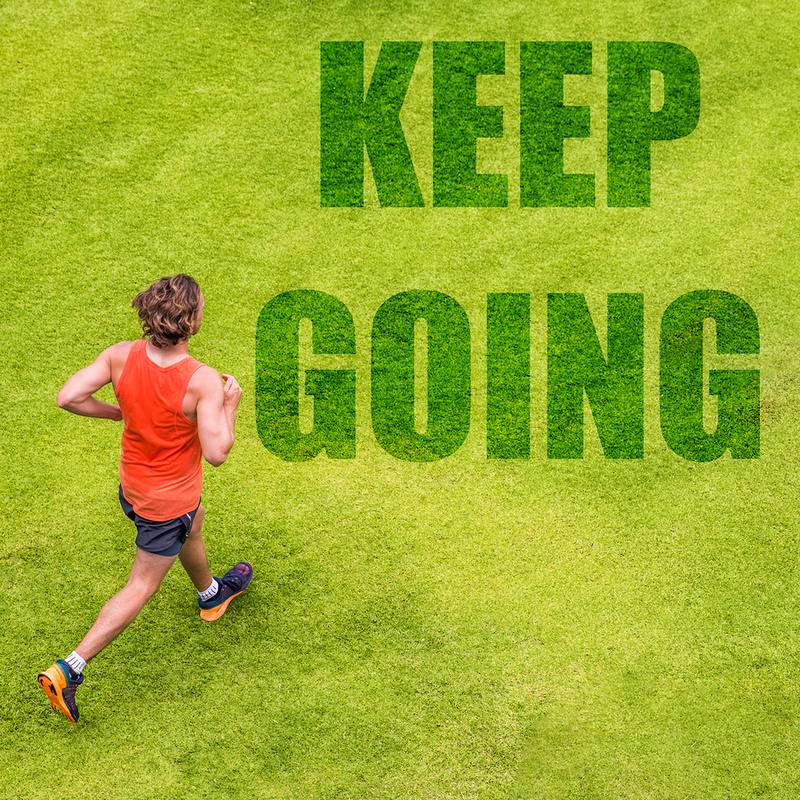 You don’t necessarily have to stop running, you just have to figure out what’s right for you and figure out how important you’re running goal really is to you. Then impress upon your doctor that that’s the goal. Doing this race, getting it to heal by these particular times so you can continue to train and run, that’s the goal. Don’t take anything less in that from your doctor. So go to your doctor, armed with what you know here and then make a real decision about what’s most important to you, how fast you want to get back to running and what you’re willing to do to make that happen. If you can do that then you can figure out whether or not you should really run with a partial rupture in the plantar fascia right now.